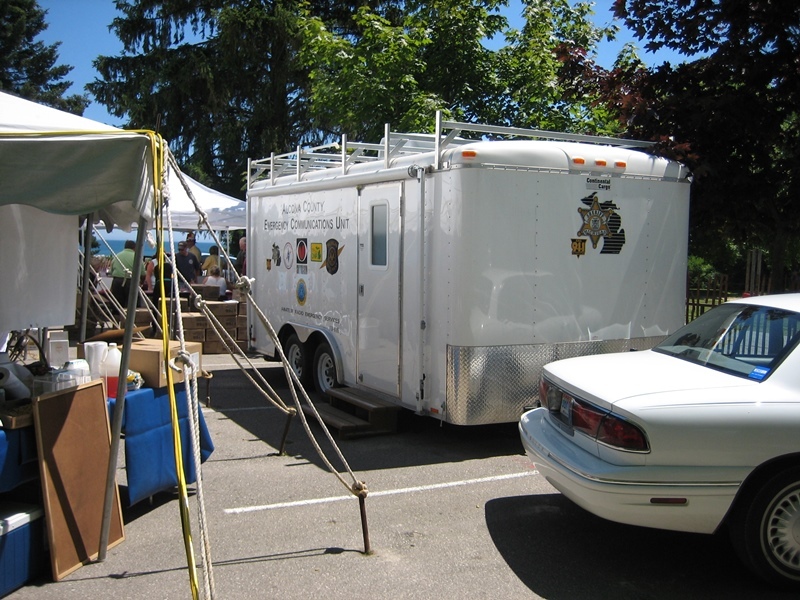 This Alcona County Emergency Communications Unit (trailer) was a joint project between the Alcona County Amateur Radio Group and the Alcona County Office of Emergency Management. Supporters of this project were the Alcona County Board of Commissioners, the Alcona County Sheriff, Michigan State Police, Firefighter’s Association, Road Commission, L.E.P.C., EMS, 911 Dispatch, DNR, US Forest Service, US Coast Guard, US Coast Guard Auxiliary, American Red Cross, National Weather Service, and other governmental organizations. This partnership, along with area businesses and others with an interest in public safety and amateur radio, donated funds, time, materials and labor to make this project a reality. While the trailer, basic radio equipment and antennas have been completed, this project is one of continuing updates and modifications. If you are interested in helping us maintain our capability, contact Stan, W8SZ, for information.